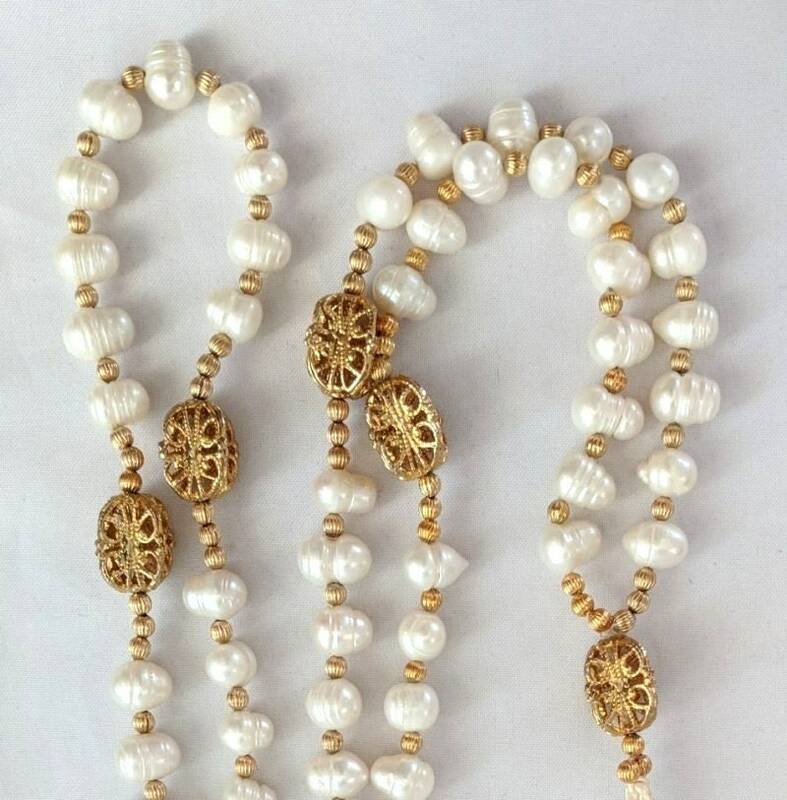 This rosary has 70 freshwater pearls with 3mm gold plated spacer beads between each 8mm-10mm baroque pearl (irregular shaped). 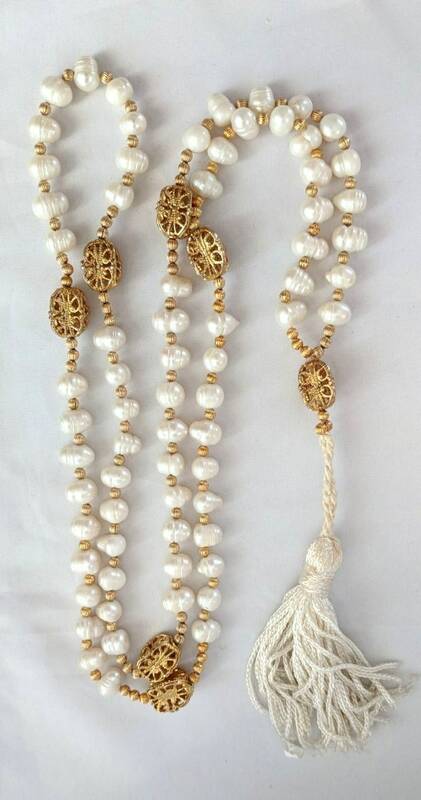 All are strung on silk beading thread and are is divided into 7 decades by gold plated filigree beads that are rectangular (13mmx10mm) in shape. An off-white tassel hangs from one of the paternosters. It is documented that tassels were used to wipe away the tears of sorrow. Divided in half, it hangs approximately 22" including the tassel. This style of Franciscan rosary was popular before they were standardized at the Council of Trent in the late 16th century. This particular bead arrangement was inspired by a late 15th century coral and bone rosary in the Erzbischofliches Diozesan Museum in Cologne that was of Flemish/German origin. FRANCISCAN ROSARY - The Franciscan Crown has variously been called the Franciscan Rosary, the Seraphic Rosary or the Rosary of the Seven Joys of Our Lady. The "Seven Joys" is a devotion that recalls seven joyful episodes in the life of the Blessed Virgin Mary. The practice originated among the Franciscans in early 15th-century Italy. 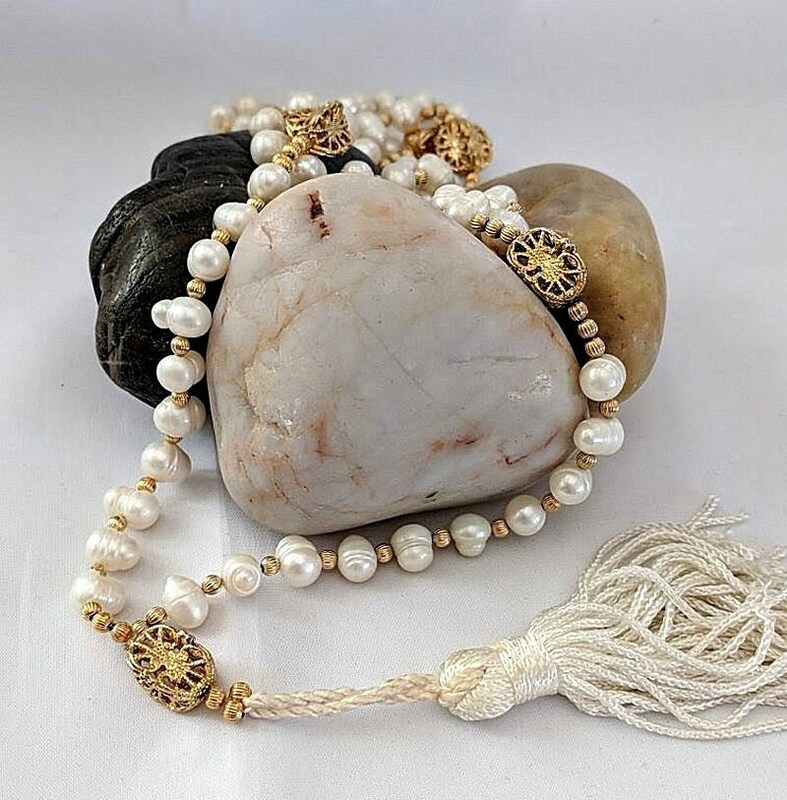 BIBLICAL PEARLS - Pearls are frequently mentioned in the New Testament, ( Matthew 13:45 ; 1 Timothy 2:9 ; Revelation 17:4 ; 21:21 ) and were considered by the ancients among the most precious of gems, and were highly esteemed as ornaments. The kingdom of heaven is compared to a "pearl of great price." 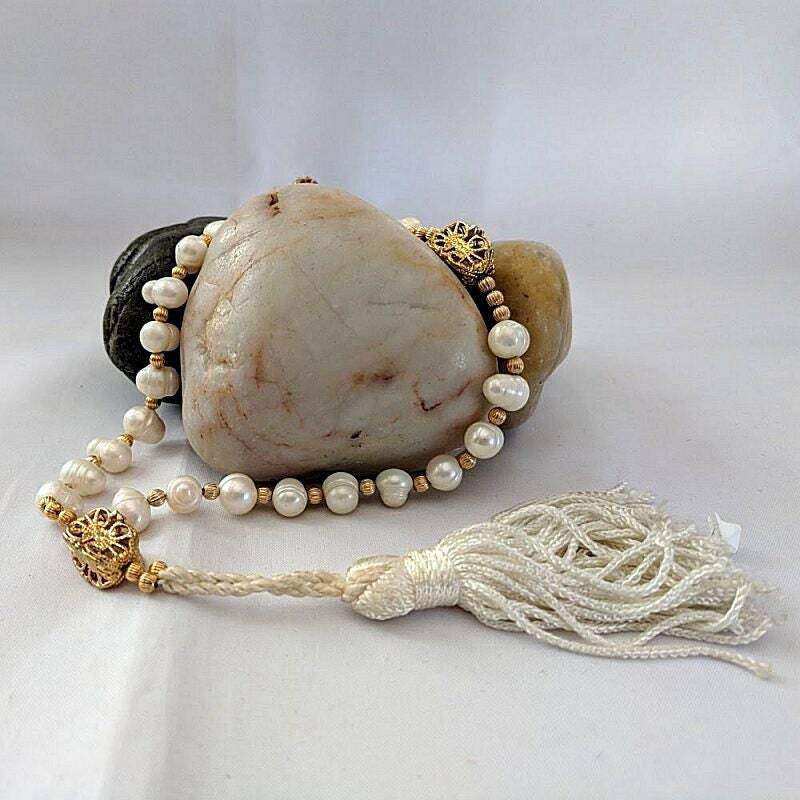 In ( Matthew 7:6 ) pearls are used metaphorically for anything of value, or perhaps more especially for "wise sayings," i.e. Pearls of Wisdom. 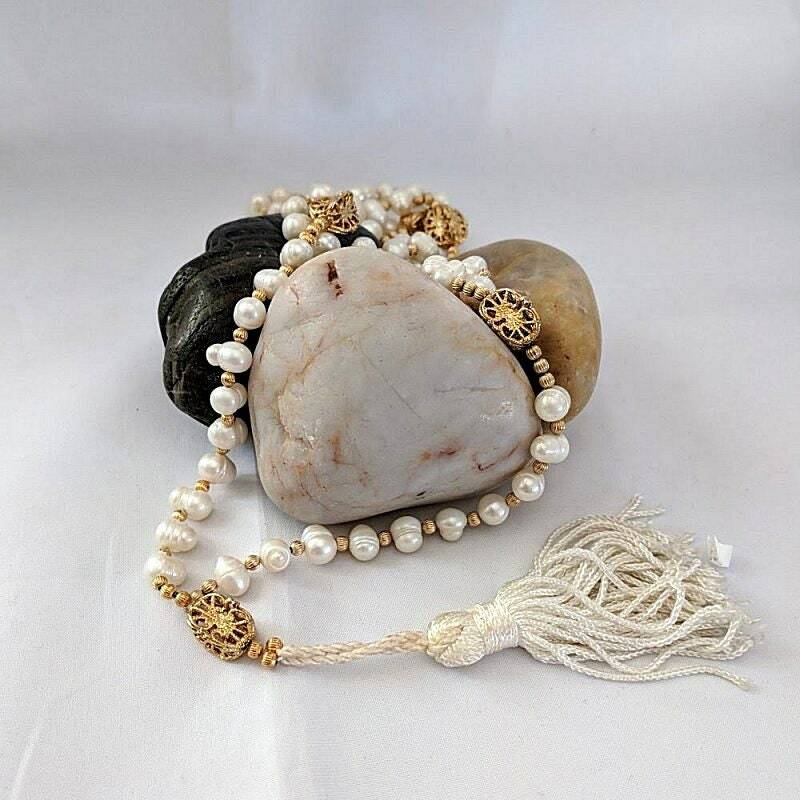 METAPHYSICAL - Pearls are said to give the wearer a sense of calmness and stability, and to promote faith, loyalty, truth and purity. They can especially enhance personal integrity.